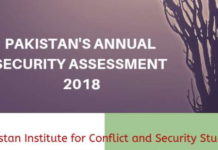 Statistics issued by the Conflict Monitoring Center show a considerable rise in suicide attacks in Pakistan during the year 2013, which was the deadliest year since 2010. 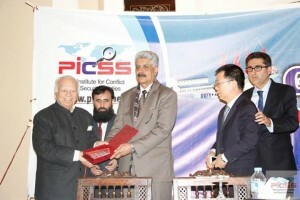 According to the data released by the CMC, Insurgents fighting against Pakistani state have carried out 47 suicide attacks during the year 2013 in which 701 people including 451 civilians, 129 security forces personnel, six pro-government Razakars and 115 militants were killed while 1582 people including 1347 civilians, 225 security forces personnel and 10 militants were injured. Pakistan has witnessed 376 suicide attacks since 2002 when first suicide attack was carried out after 9/11. According to Conflict Monitoring Center’s tally, 5710 people have been killed in the country during last eleven years. According the statistics 47 percent of the suicide attacks in 2013 were carried out in Khyber Pakhtunkhwa province during 2013 where the militants carried out 22 suicide attacks killing 249 civilians, 40 security forces personnel, and 55 militants. 656 people including 608 civilians, 42 security forces personnel, and six militants were also injured in suicide attacks during the year in the province. In KP, most affected district remained Peshawar where nine suicide attacks were recorded during the year. Almost half of the fatalities in KP were recorded in Peshawar. Bannu, Hangu and Mardan saw three suicide attacks each during the year while two suicide attacks were recorded in Dera Ismael Khan and one each in Lakki Marwat and Swat districts. Most lethal suicide attack in KP was carried out in September in Peshawar on a Church that killed 85 and injured 123 people. Most lethal suicide attack against security forces in KP was carried out in Lakki Marwat where ten militants had assaulted a security forces camp, killed 13, and injured eight security forces personnel. Number of suicide attacks in KP increased by 27 percent in 2013 from 2012 when militants had carried out 16 suicide attacks in the province. Suicide attacks in KP during 2013 were more lethal than 2012 as number of deaths increased by 79 percent and injuries by 76 percent. Second highest number of suicide attacks in 2013 was carried out in Baluchistan where 199 people were killed and 526 injured in 10 such incidents. Among the killed, 133 were civilians, 50 security forces personnel, six pro-government armed Razakars, and 10 militants while 455 civilians, 67 security forces personnel and four militants were injured in these attacks. Most lethal attack in Baluchistan was carried out in January on Alamdar road Quetta in which 73 people including senior police officials were killed and 200 injured. Quetta remained most affected district of the province where eight out of ten suicide attacks in the province in 2013 were recorded. One suicide attack each was recorded in Chamman and Qila Abdullah districts of the province. Third highest number of suicide attacks was observed in FATA where the militants carried out 9 attacks during the year which killed 135 people including 63 civilians, 33 security forces personnel and 39 militants and 317 people including 212 civilians and 105 security forces personnel were injured. 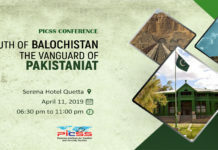 North Waziristan saw highest losses of lives of security forces personnel in suicide attacks where 31 security forces personnel were killed and 103 injured. Two suicide attacks were recorded in Khyber Agency and one each in Bajour, Kurram, and South Waziristan. During the year 2013, Sindh province witnessed four suicide attacks one each in Jacobabad, Karachi, Shikarpur, and Sukkur. 17 people including four civilians, five security forces personnel, and eight militants were killed while 69 people including 62 civilian and seven security forces personnel were injured in these attacks. Most significant attack in Sindh province was carried out against ISI’s compound in Sukkur when at least five suicide bombers blasted an explosive laden vehicle with the building and then entered in the compound causing huge damage to lives and property. In Punjab, the lone suicide attack was carried out in Rawalpindi on an Imam Bargah in which four people including two civilian, a policeman and the suicide bomber were killed while 14 people including 10 civilians and four policemen were injured. In Azad Kashmir, only one suicide bombing was recorded and that too was not a suicide attack. Rather some militants were cordoned off by local population and two of them had blown themselves up due to fear of arrest. During the year 2013, the number of suicide attacks against military and paramilitary forces increased significantly. 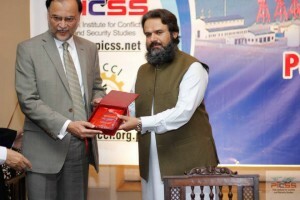 Four and one suicide attacks were carried out against military in 2011 and 2012 respectively while in 2013, at least six suicide attacks against military (Army) were recorded by the CMC. Number of suicide attacks against paramilitary forces (FC and Rangers) in 2012 was four that increased two-times in 2013. (Eight suicide attacks). Number of suicide attacks against police remained same (eight attacks). The militants continued to target prayer places and funeral gatherings with suicide bombings. During 2013 at least two suicide attacks on funeral prayers were recorded. In one such attack DIG Baluchistan police along with other police officers was killed. Masajid and Imam Bargahs also targeted while a Church came under attack too in Peshawar. Leaders and workers of political parties like PPP, ANP, PTI, and National Peoples Party were also targeted by suicide bombings during 2013. The militants also carried out suicide bombings in Peshawar High Court, Sardar Bahadur University Quetta, Bolan Hospital Quetta, and a hospital in Bajour Agency. Senior civil servants like Commissioner Peshawar and Political Agent of Khyber Agency also came under suicide attacks. The militants also targeted VIPs in suicide attacks during 2013. The then Chief Minister Khyber Pakhtunkhwa Hyder Hoti, IG FC, IG Police Baluchistan, Law Minister Khyber Pakhtunkhwa were some of the VIPs targeted by suicide bombings. Except the Law Minister Israr Gandapur, rest of them survived these attacks. The militants also carried out a devastating suicide attack against ISI’s offices in Sukkur city of Sindh province. Statistics show the ability of target selection and execution of successful attacks improved in 2013. 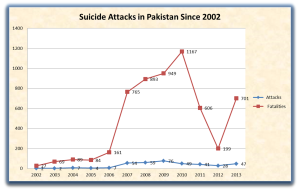 Suicide attacks started to rise after Lal Masjid operation in 2007 as before that incident number of suicide attacks had never crossed into double figure in any year. A consistent rise was observed in number of suicide attacks until 2009 when military had rooted out militants from Swat and South Waziristan. Sharp and consistent rise in number of deaths was observed from 2007 to 2010 in suicide attacks however, a sharp decline in deaths was observed afterward. The year 2013 once again changed the trend and showed an upward trend in number of suicide attacks and vertical rise in resultant deaths is observed. Province and district-wise breakup of suicide attacks in Pakistan during 2013 is in the following table.